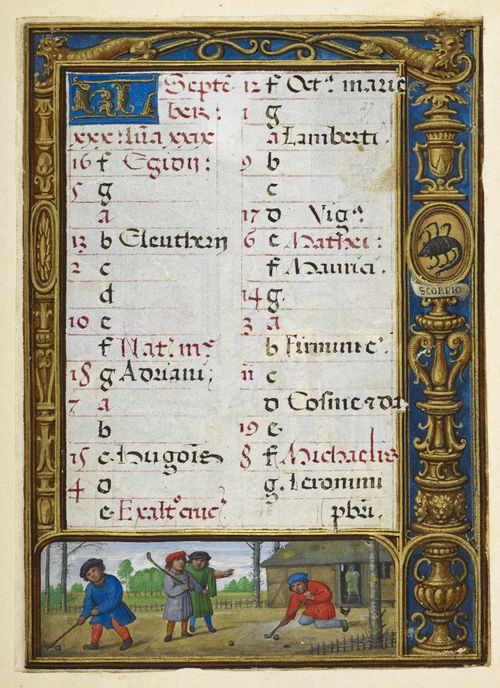 A miniature of four men playing a game resembling golf, at the bottom of the calendar page for September (London, British Library, MS Additional 24098, f. 27r). Golf may be one of the oldest of games, but it doesn’t seem to have been Shakespeare’s favourite as he never mentions it directly. He just might have played a few shots though: Mary, Queen of Scots, for one, is thought to have been an enthusiast. Its first documented mention was in 1457 when the game was prohibited in order to encourage the practice of the more useful skill of archery. Several countries claim to have invented the game, with the Chinese, the Dutch and the Belgians all joining in, but Scotland claims to have created the modern game as opposed to just a game of sticks and balls. Its name, though, is thought to come from the Dutch or German word for club or stick, and it was originally known as “gowf”. 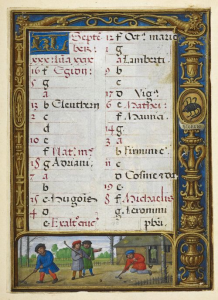 The whole page for September (London, British Library, MS Additional 24098, f. 27r). The charming image is thought to be the first representing the game. It is part of the page for September in a book of hours made in Bruges around 1540, known as the “Golf Book” because of it. The book is now held by the British Library. The man on the left is clearly playing a shot, and the pair in the middle may be discussing the next shot, or deciding how soon to head for the Clubhouse over on the right. What, though, about the man on the right? Was kneeling down ever an acceptable putting technique? There’s more information here. Golf now flourishes in Stratford-upon-Avon, but the first official Golf Club was only founded here in 1894. The Club was originally in Shakespeare’s mother’s village of Wilmcote, moving after a few years to the Welcombe Hills, on land which may have at one time belonged to Shakespeare. The Flower family owned much of the land at the time and offered the Club the use of two fields there. This site is now the Menzies Welcombe Golf Club, attached to the Welcombe Hotel. In 1925 Stratford-on-Avon Golf Club moved to its present site on the other side of the river, on the road to the village of Tiddington. The club was officially opened in 1928 by Sam Ryder of Ryder Cup fame who often played there and was at different times Vice President and Club Captain. Until recently I had never heard of any direct relationship between the Club and Shakespeare. But then a chance discussion while at my hairdresser’s provided a link. Just months after the Golf Club moved to the Tiddington Road, in March 1926, the Shakespeare Memorial Theatre burned down. There was already a connection between the Flower family, who ran the theatre, and the Club. Fundraising to rebuild the Theatre began almost immediately and the Golf Club played its part. Kept in the display cabinets at the current Clubhouse is a handsome brass plaque that testifies to this involvement. 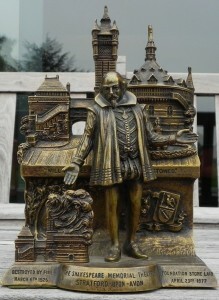 It shows the figure of Shakespeare, standing in front of the 1879 theatre. 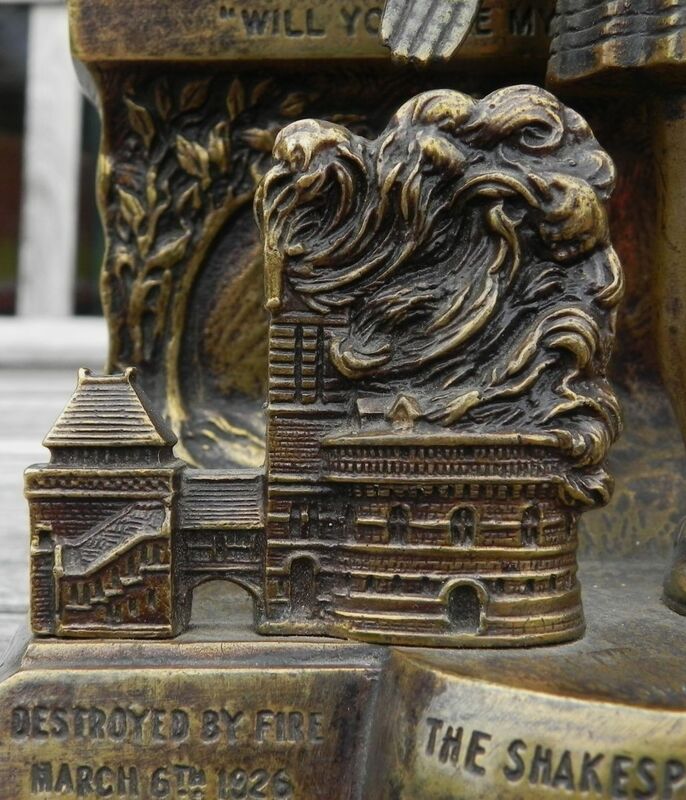 The quote from Hamlet “Will you see the players well bestowed?” , used during the fundraising campaign, is engraved on the plaque along with the date of the fire and the name of the Theatre. 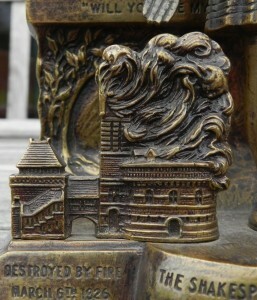 To make the point, on the left of the plaque is the theatre on fire, smoke billowing above the building. On the back of the plaque is an explanation. 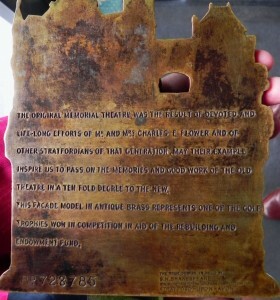 Several of these plaques were made, though they were not all cast in brass. These were sent to Golf Clubs around the country in the hope that local competitions would be set up. 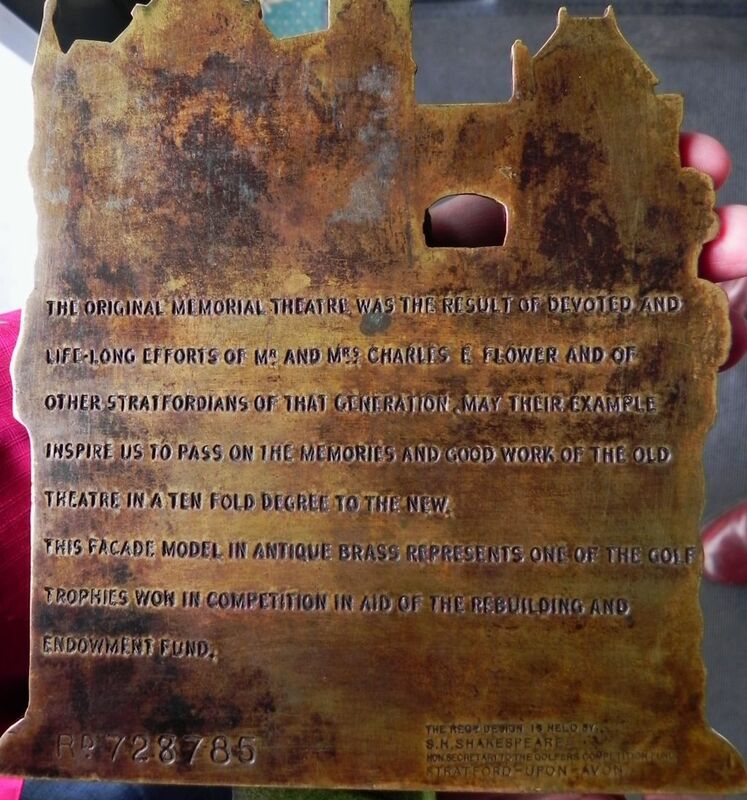 “This façade model in antique brass represents one of the golf trophies won in competition in aid of the rebuilding and endowment fund”. As the plaque shows the old theatre rather than the redesigned building that opened in 1932 they were probably created soon after the fire, in 1926 or 1927. 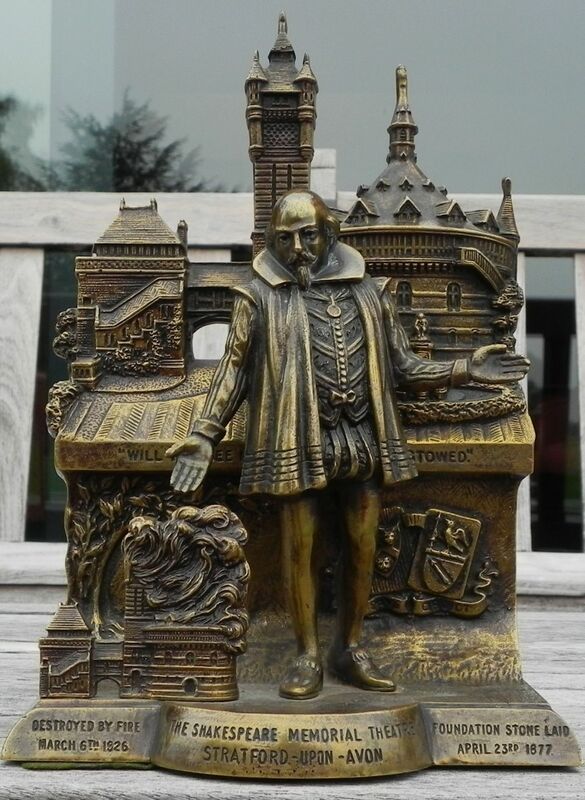 They’re delightfully detailed, featuring Shakespeare’s coat of arms and Stratford’s, and though it was impossible to get a photograph it shows not just the Gower Memorial but the statue of Prince Hal holding the crown of England above his head. At the time of the fire the Gower Memorial stood outside the theatre, being moved to its present position only around the time of the 1932 opening. In John Gee’s book celebrating the club’s centenary, Confident Century: Stratford-on-Avon Golf Club 1894-1994, there is a section, inevitably, on Shakespeare and golf. He quotes a facetious comment that appeared in the Stratford-upon-Avon Herald in 19 March 1987. So far from there being difficulty to establish a connection the fact is that Shakespeare’s works abound in the most direct and explicit references to the pastime in question. Thus we find in Much Ado About Nothing an unmistakeable allusion to a characteristic St Andrews gesture in the words “‘I know you by the waggling of your head”, whilst in Titus Andronicus we encounter the pertinent query “What subtle hole is this? In Richard III, again, we meet the line “Put in their hands the bruising irons of wrath”, and in Henry VI part 2, the statement “I’ll call for clubs”. Falstaff’s ruling passion was evidently golf, for we know that on his death bed he “Babbled of green fields”, and there was certainly a course on Prospero’s Island, else why the question “why hath the Queen summoned me hither to this short grassed green?” There are we believe some commentators who prefer the reading “To tee or not to tee, that is the question”. But apart from this disputed passage we find in Hamlet a referenced to the fault of “Slicking too short”. Many other references might be given, but the foregoing are surely enough to prove that Shakespeare had an intimate knowledge of the game. I’d like to thank Francis Prentice who started me off on the subject, and to Hugh Begg for kindly allowing me access to the plaque at Stratford-on-Avon’s Golf Club. This entry was posted in Shakespeare's World, Stratford-upon-Avon and tagged British Library, golf, Stratford-on-Avon Golf Course. Bookmark the permalink.